When I get back from a family holiday tomorrow I’ll be frantically crafting boxes and dashboards again, trying to keep up the momentum that currently has us on track to finish the FlickFleet Kickstarter fulfilment in August - four months earlier than we promised on the Kickstarter. Paul and I are going to meet up briefly on Wednesday for a clandestine one-way exchange in a pub near the station as I journey home from a work trip to Manchester. As I’ll be travelling for six hours and in a remote office that day I’ll not be able to take any finished boxes with me, but I’m hoping to take some flat-packed cut box lids for Paul to sign and to collect a bag of ~25 games’ worth of bits (which I hope Paul will surreptitiously slide under the table like a spy) for the last leg of my journey home. That will let me complete and ship the Reinforcements pledges over the next couple of weeks, well ahead of the end of June deadline. I’m hoping that in addition to signing the box blanks we can spend an hour or so over a quiet pint discussing what we want to do next. Come August I’m hoping to have completed the FlickFleet Kickstarter pledges, freebies and pre-orders which will leave us with ~130 games’ worth of FlickFleet pieces and a laser cutter cooling its heels in the corner of Paul’s garage. So what’s next? We have a number of ideas for more FlickFleet content (scenery, extra ship types, extra races) and a number of people have already said they would definitely want/back some of those things. Is that what we should do next? Should we try to Kickstart a professionally manufactured standard print run instead/as well? Should we focus on other games? All of these are up for discussion - if you have a preference please let us know below! A brief blog post this week as I’m away on holiday with my family at the moment. Last week I finished the 100th FlickFleet box (that’s 1/4 of the print run and over 40% of the Kickstarter rewards completed). 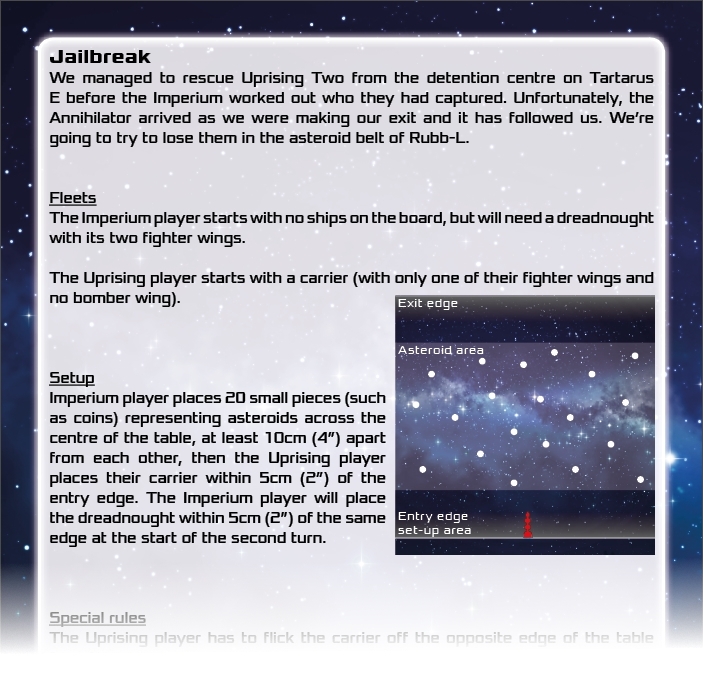 I also tested and posted the first FlickFleet scenario on the web. We’re hoping to build up a large collection of additional scenarios, so if you’ve designed one, please send it to us and we’ll get it up too. I’ll be taking this week off, with the possible exception of some more scenario design as I play it with my family. When I get back I'll be making more Zombology copies as we have another stocking order from our single retail supplier. For the last several weeks our focus has been on making games - Paul has been flat out laser-cutting ships and bagging bits and I’ve been spending several evenings a week making games and then most of my lunch breaks taking the week’s batch of completed games to the Post Office. Paul is now way ahead of (even our accelerated) schedule and I’ve used up and posted the last of the bits I got from Paul at the end of February, so I can’t post any more games until we meet up and exchange bits again. I’m still making boxes and cutting dashboards, but those are now stockpiling ready for our next exchange of bits. This frees up my lunch breaks this week, so I’m planning to try out some new scenario ideas so I can get them up on the website - now that 75 people have the game I want to ensure there’s plenty of scenarios available to keep them entertained. Next week I’ll be on holiday with my family (16 of us! ), so I’ll not be making any games, but I’m betting we’ll play some FlickFleet as I’ll be hand delivering my brother’s and sister’s copies and I think my nephew and nieces in particular are very keen to play. Until then, I'll be crafting another batch of boxes, etc. that will take us to over 100 completed games - that's a quarter of the run! I've also done a little Zombology this week too - I've still got 49 of those to make (20 of which are for Kickstarter backers). It’s the end of March and the end of the first quarter of the year this week. I have a number of tasks I do monthly and a few I do every quarter, so in addition to shipping the 13 copies of FlickFleet I finished on the weekend I’ll be doing a Kickstarter update (monthly), financial reporting to Paul (monthly and quarterly), sending out an email newsletter (quarterly) and a board report to our board of advisers (quarterly). It’ll be a busy week, but we’ve had a great few months and I’m looking forward to sharing that with the various groups of people who receive those messages. As with many startups we got off to a slow start, racking up costs associated with FlickFleet development and the Kickstarter without any sales to offset them. Now that we have started shipping (and are ahead of schedule :-) ) things are looking much more positive! I've also run out of cut ships now, so after I've posted last week's games I'll just be building up boxes until Paul and I meet up, then I can give them to him so he can start shipping too. I had a really busy week at work last week and The Toddler had a cold and hence slept even worse than usual, but I still managed to get 13 copies in the post (the last of the Uprising Heroes and a prize for the design a scenario competition I held last year). On the weekend I made another 12 copies (the first of the Reinforcements tier - due in June). That leaves me with another 12 games’ worth of bits that I got from Paul on our weekend away recently. Once I’ve finished those (hopefully this week) I’ll be building up boxes again for our next exchange of pieces. I’ve got three more weeks of crafting and then I’m away for a week’s holiday with the whole of my family (16 of us) during which I imagine we’ll play some games of FlickFleet. At the moment I’m focusing on trying to get as many made and shipped as possible before we move house in the next 2-3 months. He drew in the line with a Sharpie pen and then quickly wiped off the excess with a WD-40 soaked paper towel! The first deluxe tier in our FlickFleet Kickstarter was set for delivery in March 2019. The Kickstarter completed on the 8th Dec and we didn’t get the funds until the 21st (by which time I was already on Christmas holiday!). 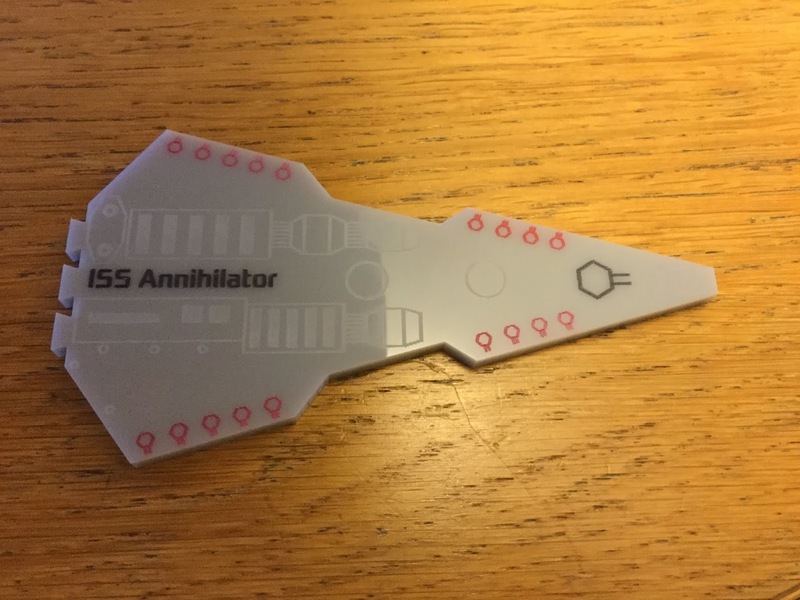 We didn’t start ordering things until early January and the laser cutter wasn’t fully operational until early February, so it was always going to be tight, but I’m delighted to say that I finished the last of the 52 copies we needed to make last night (Paul is way ahead of me!) and I’ll be posting them all this week - with two weeks to spare before the end of the month I’m very hopeful that they’ll all arrive on time. It feels great to be making and shipping copies on time and also to see it out the wild with people enjoying it. I’ll be sending out the next Kickstarter survey this week and hope to start shipping the next tier of rewards (due in June) next week. I should be able to do about thirty of those before running out of laser cut bits at which point I’ll have to meet up with Paul again to get some more. I’ve also been thinking about what's next after FlickFleet fulfilment completes. I’ve a couple of game ideas that meet the Eurydice criteria (fast, fun and unique) but they all require a decent chunk of work before they are ready (if ever). As I mentioned last week, we’re now shipping FlickFleet. On Saturday Paul posted 28 of the 30 copies he’s done (he’s hand-delivering the last two to friends) and over the weekend I made another 11 copies of my bits and added the bits Paul gave me last weekend to them and I’ll be posting those during my lunch breaks this week. The first and last groups of games were always going to be the tightest - the first because we had to order everything and get the laser cutter set up and running properly; the last because there’s well over 100 of them. I’m delighted that we’re on track still - so many Kickstarters deliver late, to be making all the games by hand and still hitting our deadlines is a real achievement, and it’ll set us up nicely for future Kickstarters - we’ll have a reputation for trustworthiness in terms of delivery that can only be earned by coming through on your promises. The next challenge will be that we’re moving house in the next few months which will obviously be disruptive - I want to get as many copies shipped before the move as possible to minimise the disruption. Back to the crafting board!